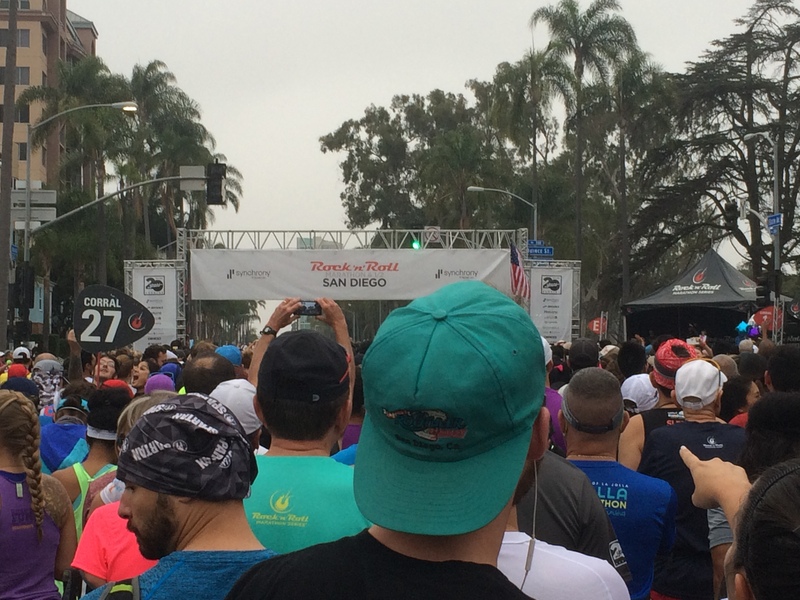 I think that I will always think of the 2017 Rock n Roll San Diego Half Marathon as “The Race that Could Have Been.” I will wonder how this race would have turned out if I hadn’t fizzled in my training the two months before. What if I was able to put together a fantastic last month? What if I hadn’t fizzled at all? There’s nothing I can do about that now. Just like there’s nothing I could have done about it on race day. This race is what it was. 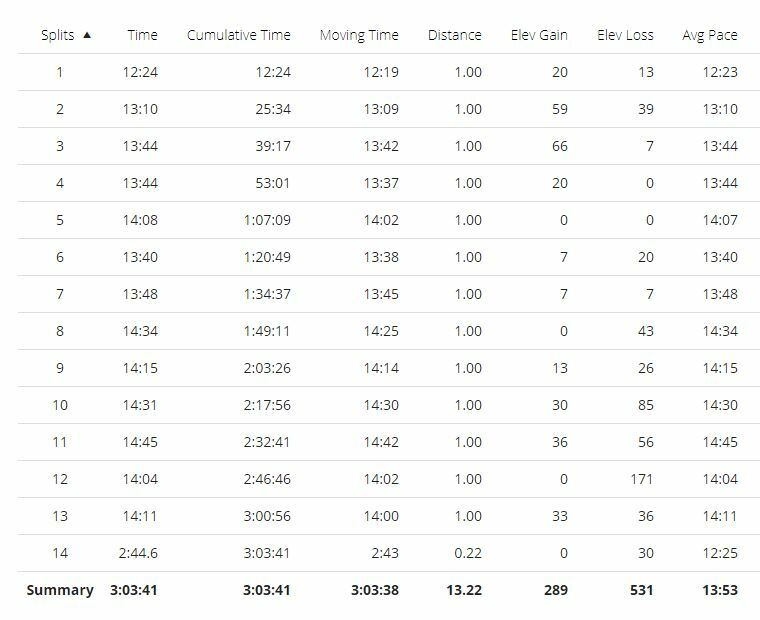 Even though it wasn’t the half marathon PR I had really wanted when I started training, it was still fun. I have to share these few photos from the night before the race. 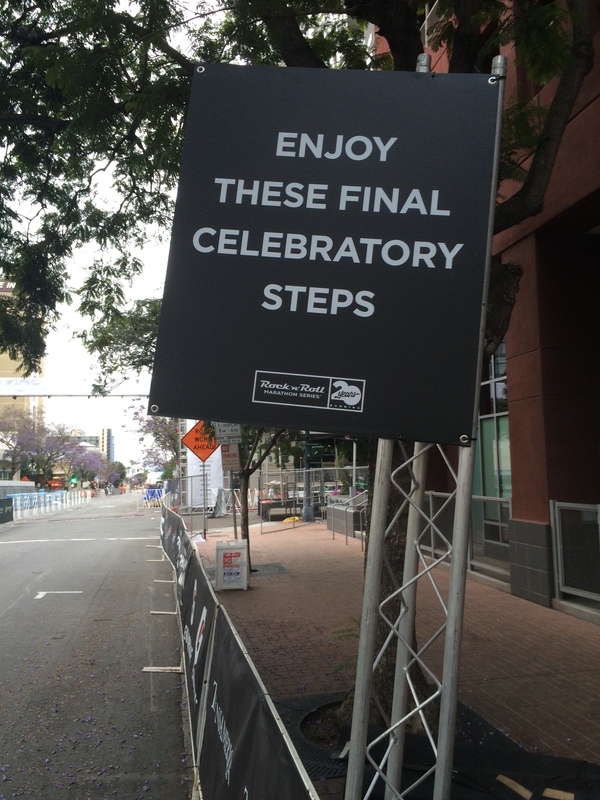 I took a photo of this sign because I knew I wouldn’t be looking at it or for it when I got back here on race day. 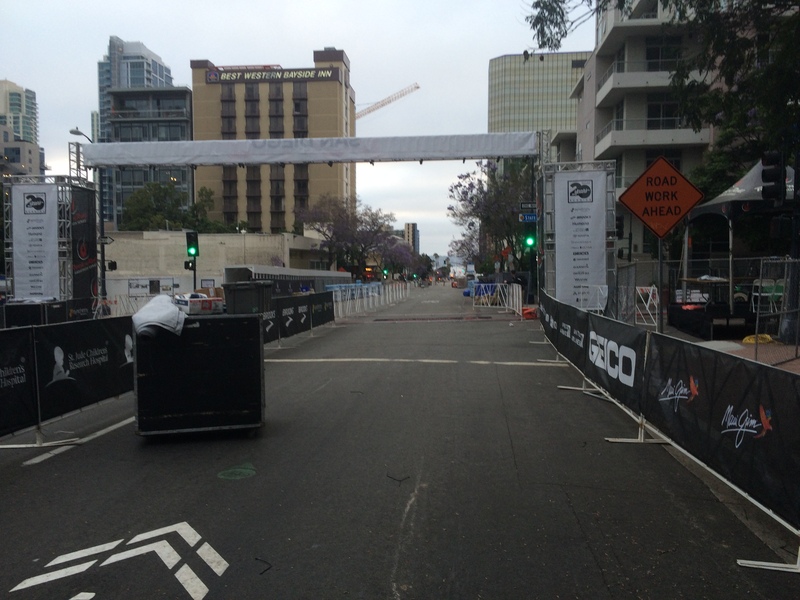 As I walked back from my last dinner before the race, it was fun to walk by the finish area…which was still being set up. It got me really excited for the next day! I was up about a half hour earlier than the day before because I wanted to make it for the We Run Social meet-up. I always love being apart of these meet-ups! So many cool people! It’s always fun to see Andrea (aka Kimmy Gibbler) and Michael. 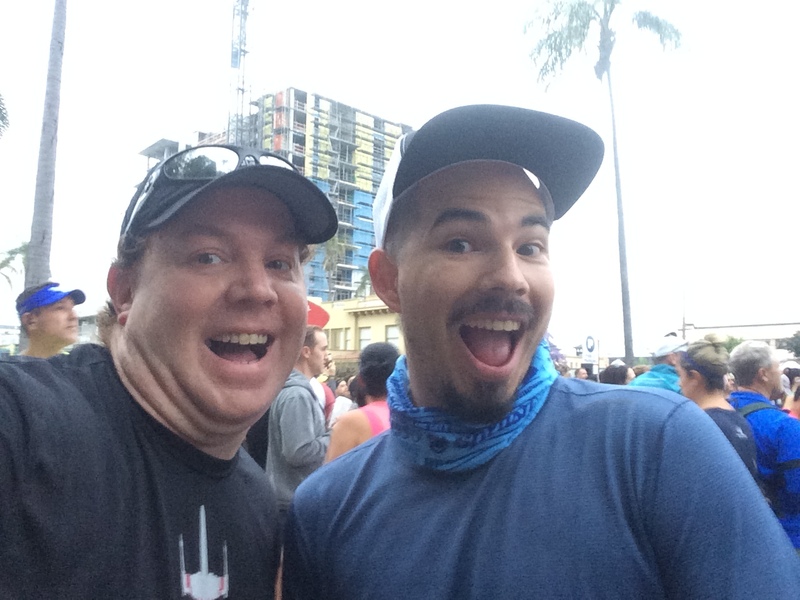 And, of course the leader of the crew…Brian (aka Pavey…aka Pavement Runner)! 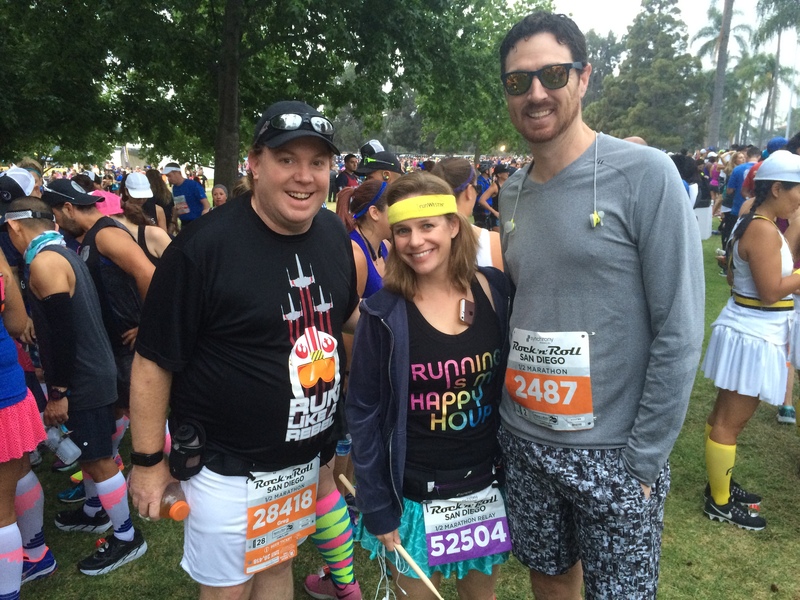 As much fun as it was to hang with the We Run Social crew, I eventually had to make my way back to my corral. Here’s where the big negative of this race experience happened for me. You see, those that were supposed to carry the Wave Number signs were late getting into the corrals. So, by the time I got back to where mine was supposed to be, folks were already pressing forward. 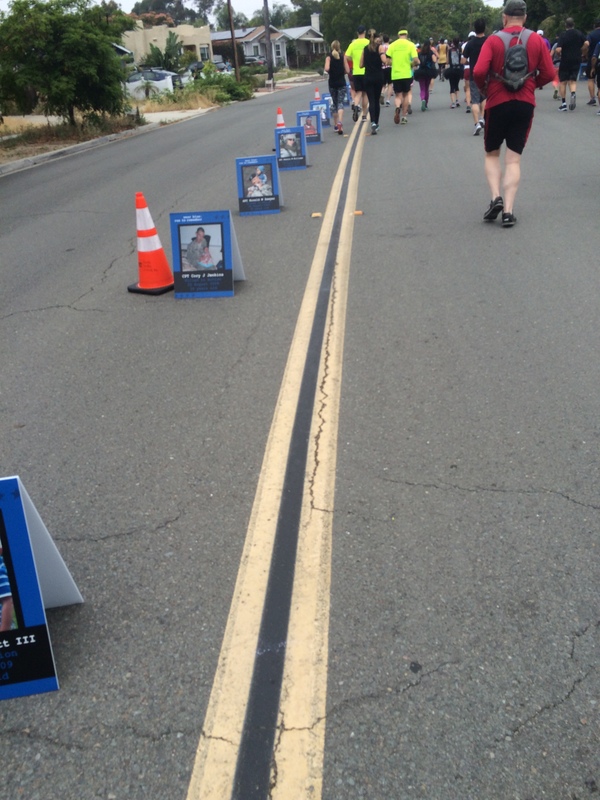 As I looked at the race bibs, it was clear that there was no separation of the corrals after corral number 20. That was the last number up. Behind them, it was a total mixture. So, I just found a place that seemed good. I think I ended up starting a couple corral numbers ahead of the one I was assigned. It was kind of crazy. I may have been ahead of my assigned corral, but eventually, we all started. My plan for the race was to run 30 seconds, walk 90 seconds and see if I could do that for an entire 13.1 miles without a fail. 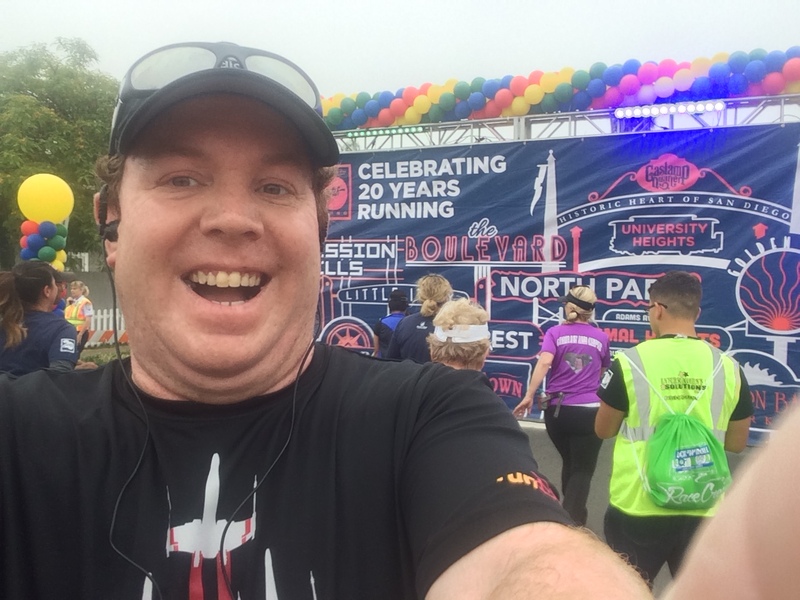 Since I was starting in an earlier corral unintentionally, I decided to start off the half marathon the same way I started the 5K the day before. I ran a minute, walked a minute for the first quarter-mile. After that, I felt like the crowd had thinned enough that I wasn’t in anyone’s way that was faster than me. The first mile was rather uneventful. I felt good the entire way and had no issues with making my run intervals. Actually, the first few miles went by with no issues whatsoever. I did find it funny that somewhere around 3.5 miles in there was a Geiko sponsored beer stop. I had to laugh. I mean, does anyone need a beer that early in the race? Oh well. I saw plenty of people stopping. I just ran by. I cold be wrong, but I believe this selfie stop was somewhere in mile 4 or 5. By the time I got to the mile 4 marker, my time was too slow for my liking. 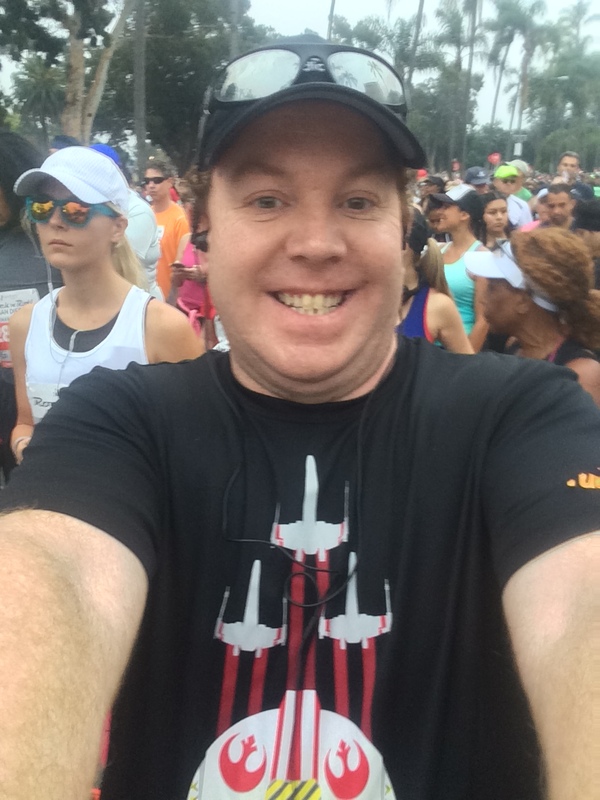 I finished the first 4 miles in 53:01. Y’all, I think my slowest 4 miles was around this time. As a matter of fact, it may have been slower. To be fair there are rolling hills throughout this half marathon. So, since I was going so slow, I decided to stop for this photo op. The funny thing is that there was a sign labeling this spot as a “selfie” stop. Yet, there were photographers to take your picture. Doesn’t that kind of defeat the purpose of the sign? Oh well, I did the selfie thing because I was already slow and there was a line for someone to get your photo. Not too far past the selfie photo spot, there were some fun signs that popped up. Yes, I had to stop with this sign. After all, it made me smile. 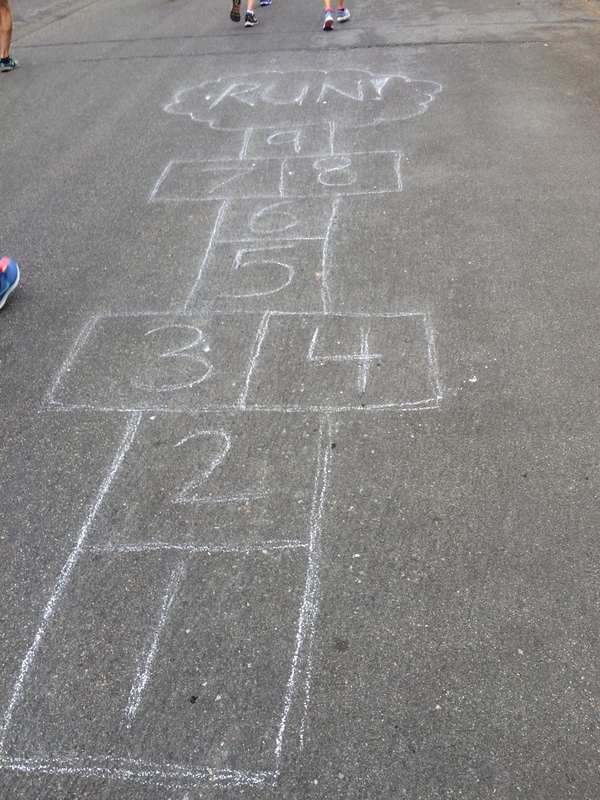 When you’re running slower than you want, you’ve just got to have some fun. I think that this pic is from the last half of mile 5. 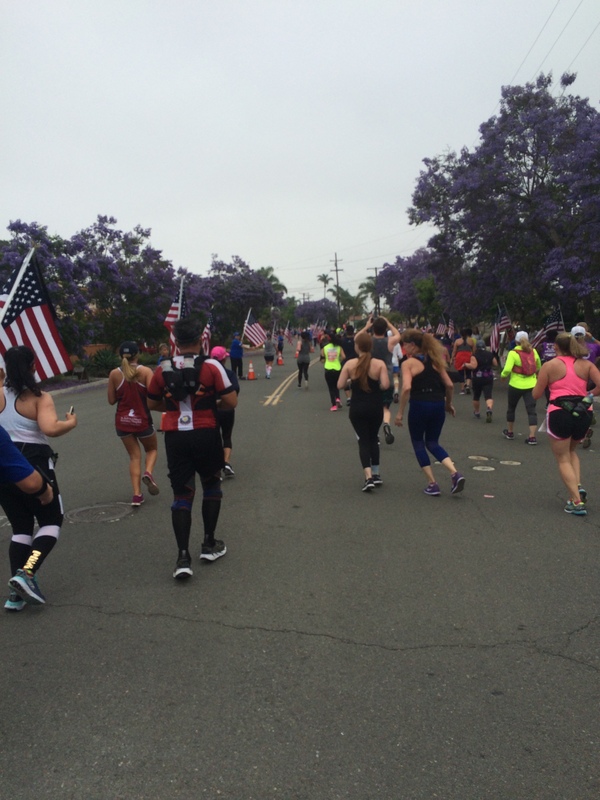 There was an entire mile saluting the military. It was like an entire mile long! First, were the signs for military members who were lost in battle. Then, just past the mile 5 marker was another half mile of people holding flags on both sides of the road. I’m sure this guy thought I was crazy to grab a selfie. But, I was coming to the end of a walk break and needed the pic before I had to run. I had no idea how long this salute was going to last. As I made my way through this mile long salute to the military, I got a little choked up. I mean, the sheer length of the tribute made it hard to not feel something. At the end of mile 5, I was at 1:07:09. As I got there, I started thinking about my training and that I wasn’t very far off my 5 mile time on my 13 mile training run. Maybe this wouldn’t be so bad. 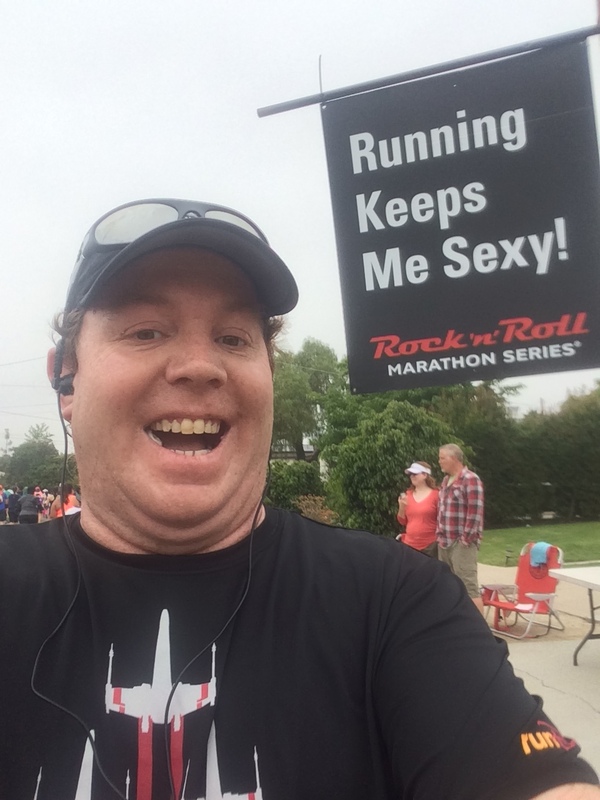 In mile 6, I started thinking about my time. I really wanted to cross the 10K mark in under 1.5 hours. As the run/walk intervals kept going, I would calculate my possible time to the 10K mark. I think that it was this focus that brought me through mile 6 almost 30 seconds faster than mile 5. Of course, it also could have been I was taking less pictures in miles 6 and 7. I did make it to the 10K mark in less than 1.5 hours. I even made it to the half way point of the half marathon in under 1 and a half hours! Could I actually pull off a sub 3 hour half marathon? In mile 7 I had found the goal to chase! 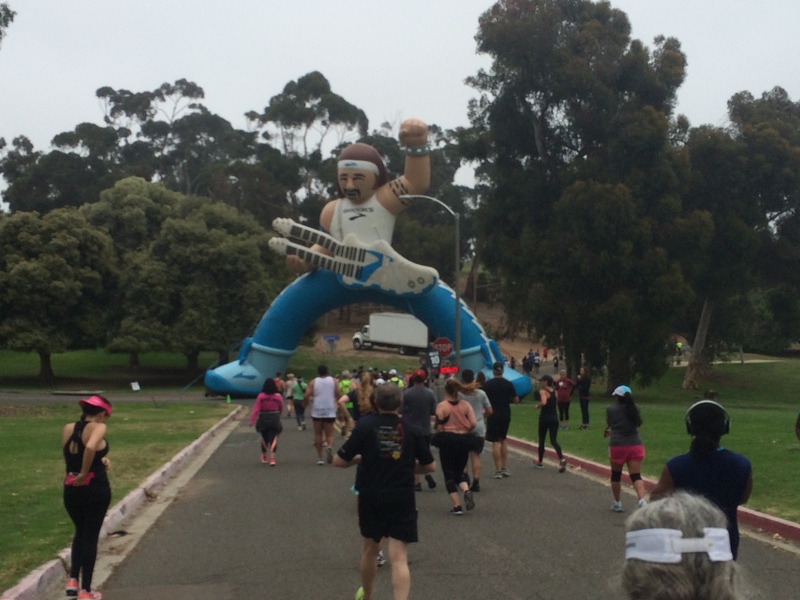 Also, in mile 7, I came across this guy. And this one. I really liked this one. 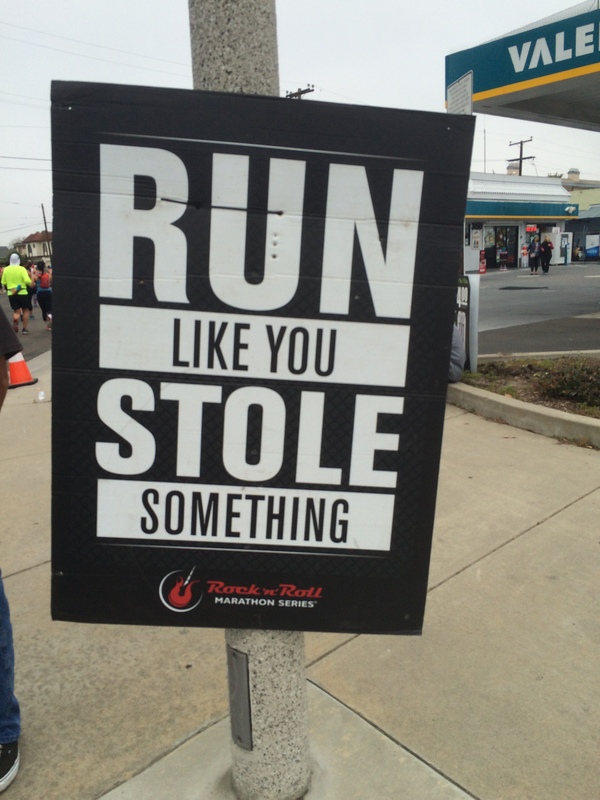 There was another sign I saw on a run interval somewhere near this sign that had me cracking up. 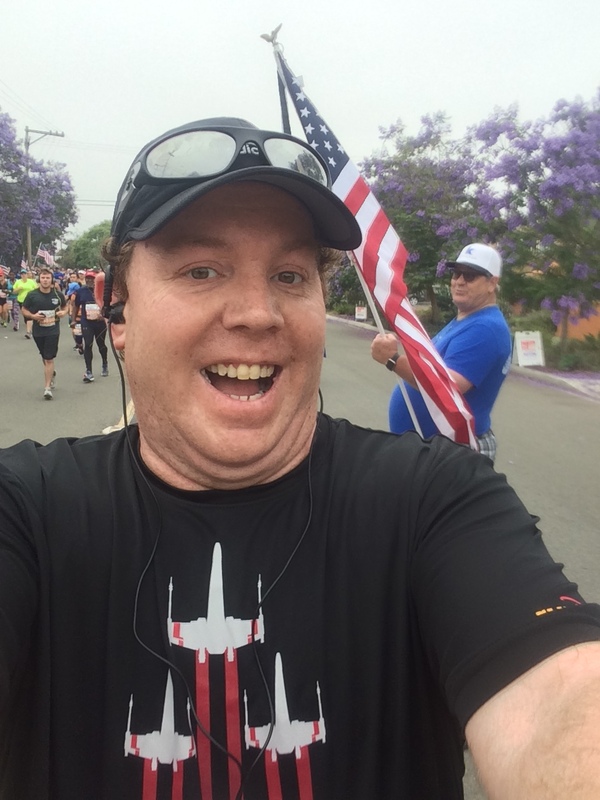 It felt good to be able to laugh in the second half of a half marathon! 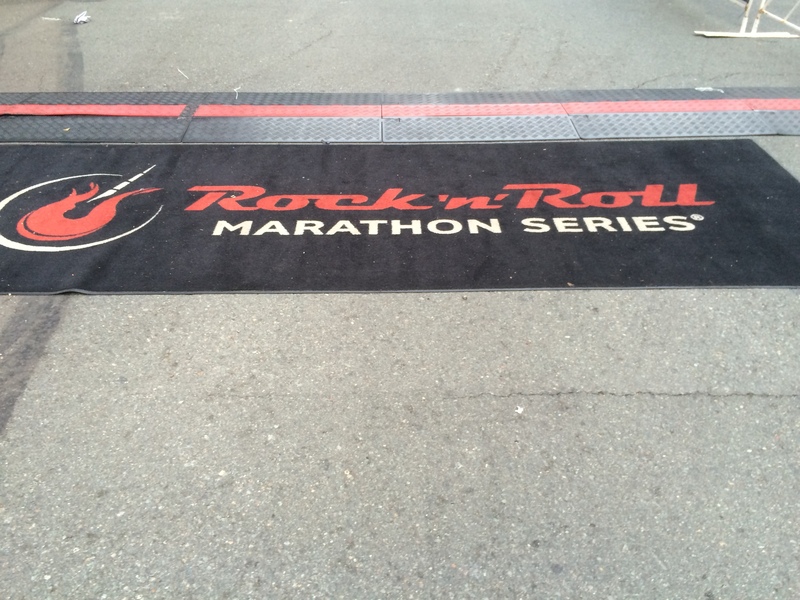 In mile 8, I ended up missing a run interval. However, I actually had a good reason. We came to the part of the course where there were many signs out in support of the Big 10 NCAA conference. It’s kind of odd to be in San Diego and see the support for a NCAA conference of schools from the mid-west. However, in this area, the ground was extremely rocky. The pavement was so bad that when I was ending the run interval before the one I skipped, I nearly twisted my ankle. 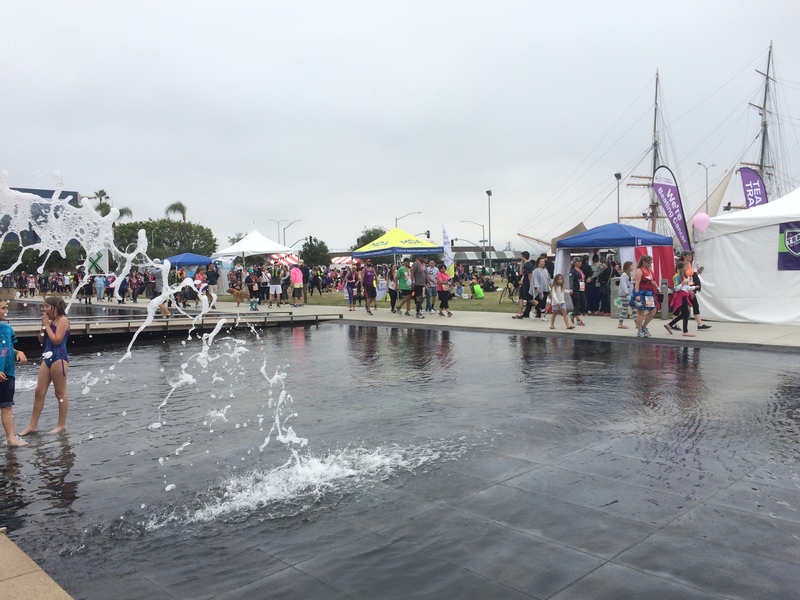 As I walked for those first 90 seconds, I saw others running and wondered how they were doing it. I was worried about twisting my ankle just walking. As I surveyed the landscape, I thought that skipping one run interval was all I’d need to get out of this rough patch. It did cost me some time, however. At the end of 8 miles, I was sitting at 1:49:11. With 5.1 miles to go, I thought that a sub 3 hour half was still in reach! In mile 9 I was tiring out. The runs were getting harder to finish. I was making every run interval. But it was hard. 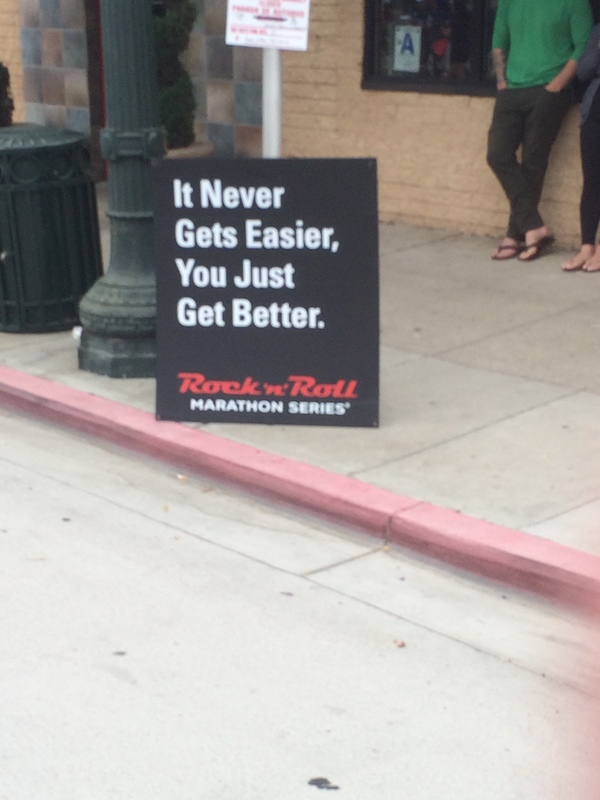 There was some relief in parts of mile 9. But, there were also some hills. I kept moving on with the goal of a sub 3 hour half. By the time we got here, at the end of mile 10, my sub 3 hour half was in jeopardy. Right past this guy, as we started mile 11, there was a big, huge hill! So, right at the start of mile 11, I missed my second and final run interval. I was feeling gassed at this point. My mouth was pretty dry. Then, there’s that hill. At the end of mile 10, I was at 2:17:56. With how slow I was moving, it was unlikely I’d get that sub 3 hour half. So, I gave in. The other missed run interval felt justified for safety reasons. This one was a pure mental breakdown. 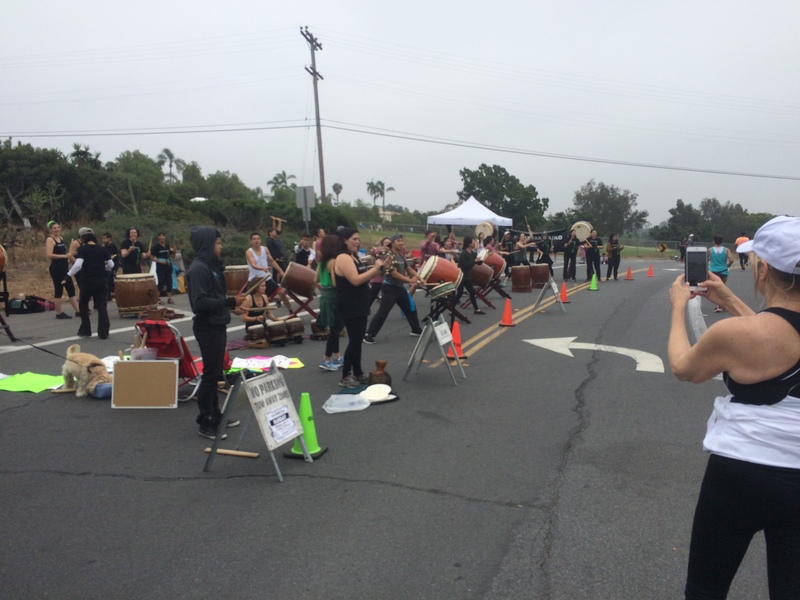 As we got to the top of that hill, we had these fun drummers to give us that extra push to get over the top. I was really happy to get to the top. I was also happy that, at the top, I had to only miss 1 run interval! Even though I knew it was unlikely I’d finish under 3 hours, I had to see how close I could come. So, I went back to the run/walk intervals. There was a big downhill at the end of mile 12 that leveled out here. 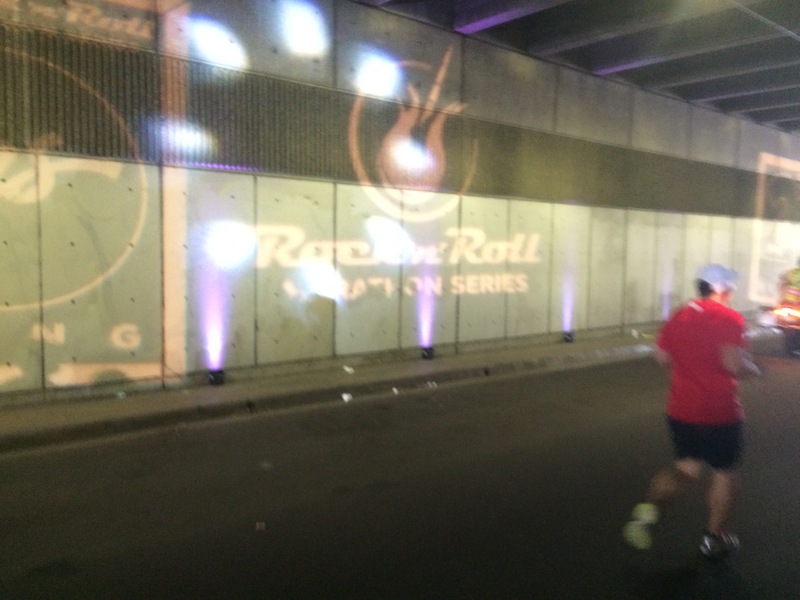 In the tunnel, they had music blaring and lots of lights and fun things on the wall. Fortunately, I was on a walk break. So, I grabbed a quick pic. By the end of mile 12, I was sitting at 2:46:46. I knew that my miles were taking around 14 minutes. At one point in mile 13, I thought I’d end up at around 3 hours, 5 minutes. At another point, I thought it would be 3 hours 10 minutes. Let’s just say that the last mile had one last hill for us to climb. It came at around 12.5 miles and lasted around 0.2 miles. This is the one run interval I didn’t finish all 30 seconds. Instead, I finished 26 seconds and needed to cut it short. I was tired. I wasn’t going to get my sub 3 hour half. So, why not take 5 seconds off? As I made my way up that last hill, I thought to my self, “How cruel is it to put this hill here?” However, when that run interval came, I thought that I needed to try to see how much of the 30 seconds I could last through. So, 26 seconds didn’t seem so bad. I kept the run/walk intervals going all the way to the end. I crossed the 13 mile marker at around a minute over 3 hours. As the finish line called, I geared up for a mad dash to the finish. Run/walk intervals don’t matter in that last 0.1. I ran as hard as I could for that final tenth of a mile. So many emotions were happening in that small part of the course. I smiled and felt so happy to be finishing. I felt some tears coming on as I knew that this would be my best half marathon as a running daddy! I had done it! 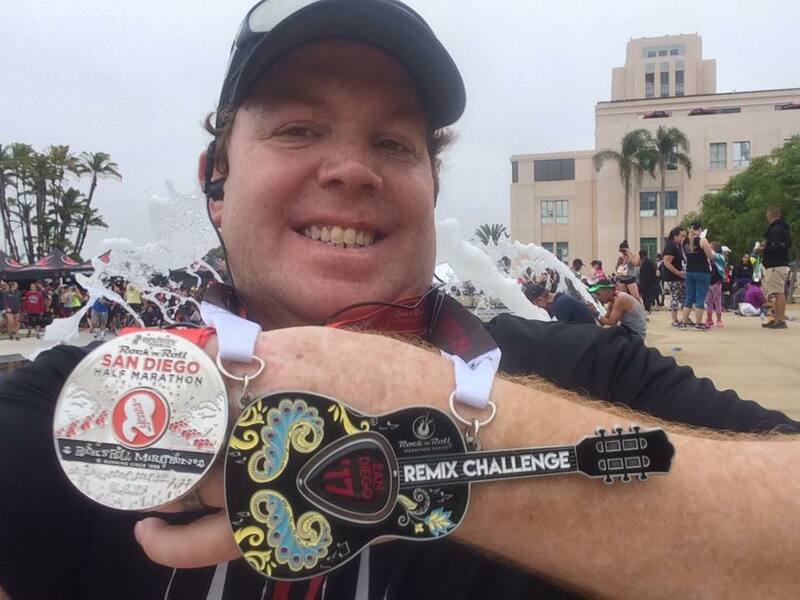 I finished the Remix Challenge at the 2017 Rock n Roll San Diego Half Marathon! I’ve got to admit that I wasn’t the biggest fan of how they had the finishers chute designed. It ended a few blocks from where the after party was happening. So, even though I was tired and wanted to sit down, I kept walking all the way to the park. Then, I had to find where they were giving out the Remix Challenge medal. After getting my Remix Challenge medal, I found this nice spot to sit and do some refueling. 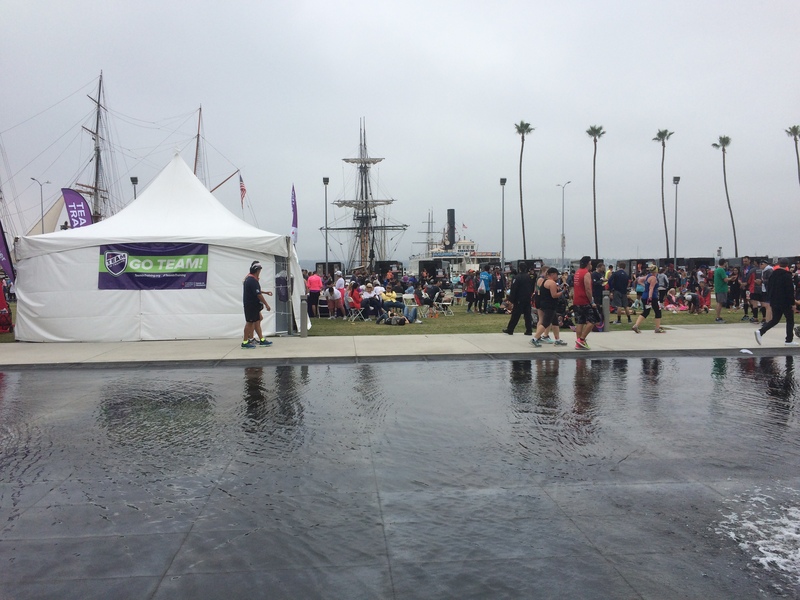 The fountains made for a nice, relaxing place to wind down after the race. 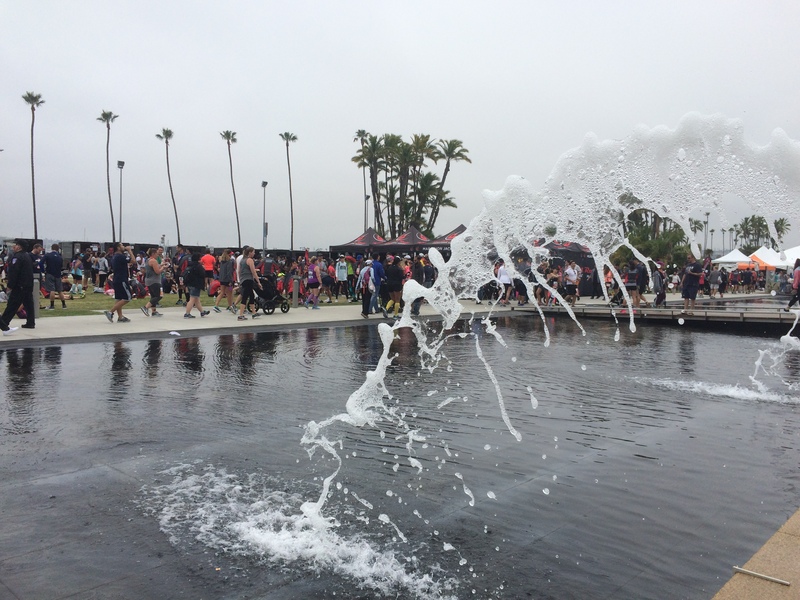 Even though I wasn’t a fan of how the finishers chute was set up, I think this park was much better than trying to get into Petco Park from 2 years ago. Here’s how the splits turned out for this race. As I look back on it, I’m proud of myself for not giving in. As you can see, I got progressively slower in each of the first 3 miles. Kept it even in mile 4. Slowed a little in mile 5. Then, fought back for miles 6 and 7. So, even thought my times slowed from mile 1 to mile 13, I kept fighting all the way to the finish line! One thing about my planning on this trip that I love is that I stayed at a hotel that was around a quarter-mile from the after party for the race. So, I didn’t have far to walk to get back to the hotel. Check out was at noon. So, I had just enough time to relax a bit in the park, walk to the hotel, get cleaned up and packed to check out before noon! Once checked out, I had around an hour before my train would leave. I was pretty tired. So, I waited it out at the train station. Unfortunately, my train home was delayed by about half hour. 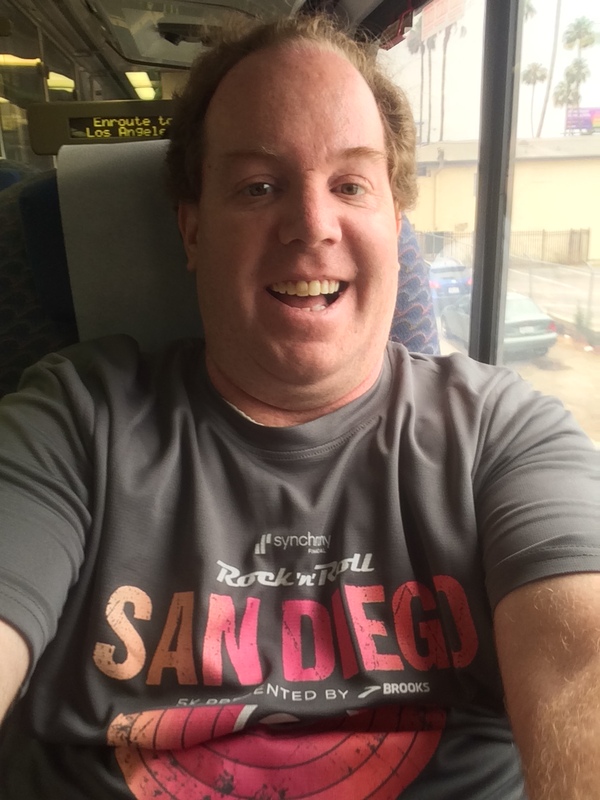 However, once I was on the train, I got to sit back and relax and let Amtrak do the driving! 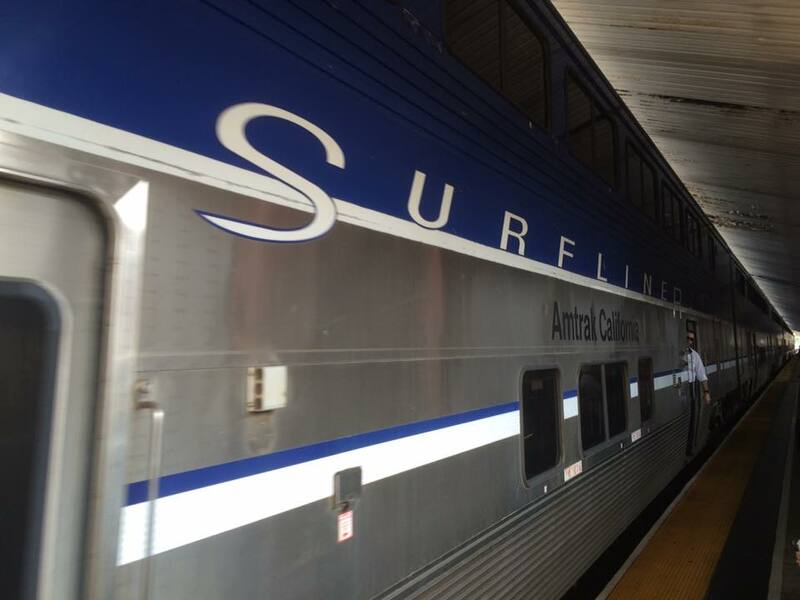 This time, I made sure to be on the side of the train with the view of the ocean! 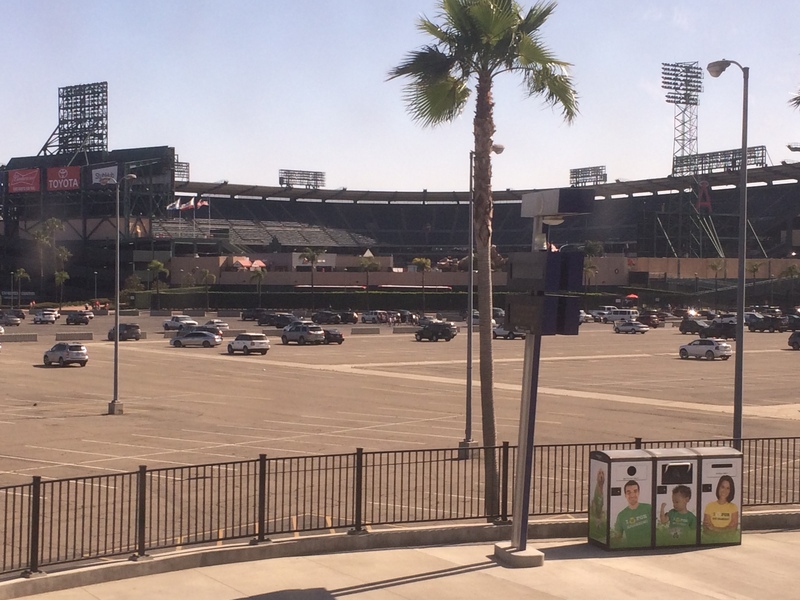 Also, I got a nice view of Angels Stadium! As I passed by, I thought of how my next race will be the Disneyland Half Marathon and I’ll be running through this stadium as part of it! 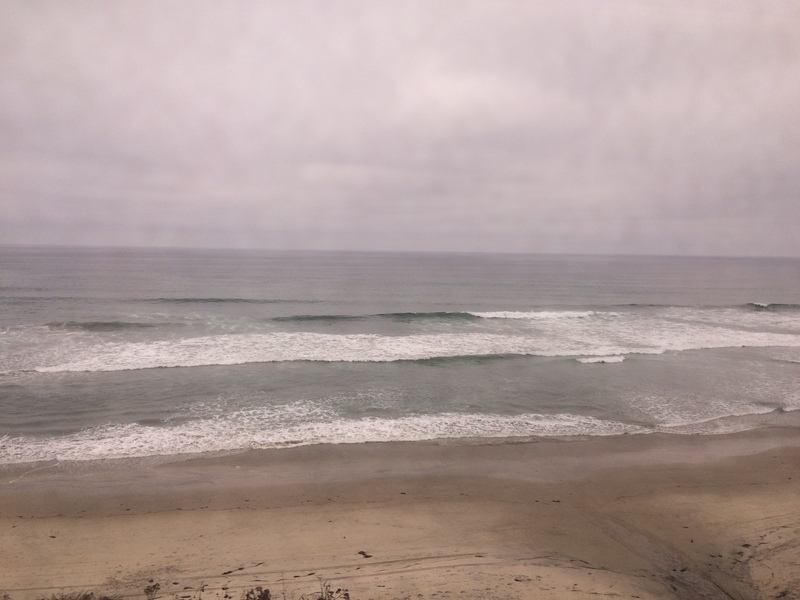 Riding the train home was perfect! My wife even met me at the train station in Pasadena when I got home with the boy! So, even though I didn’t set the half marathon PR I wanted to when I started training, it was still an amazing day! I still had a half that was just over 3 hours in spite of my fizzled out training. I will always wonder how this race could have turned out if only I had kept going in my training. 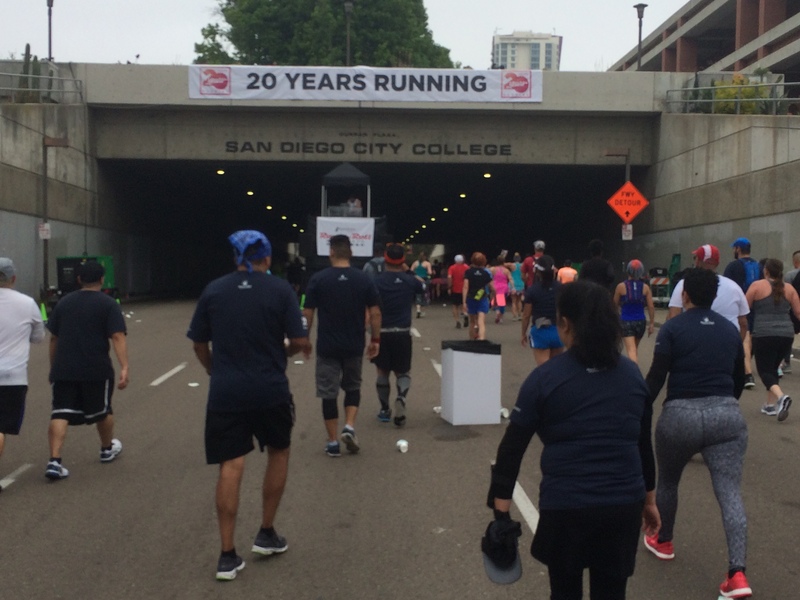 That’s the thing about running…you can’t cheat it. If you do the work, good things can happen. If you skip on your training, you loose out. At the end of the day, though, I did end up with a PR of sorts. 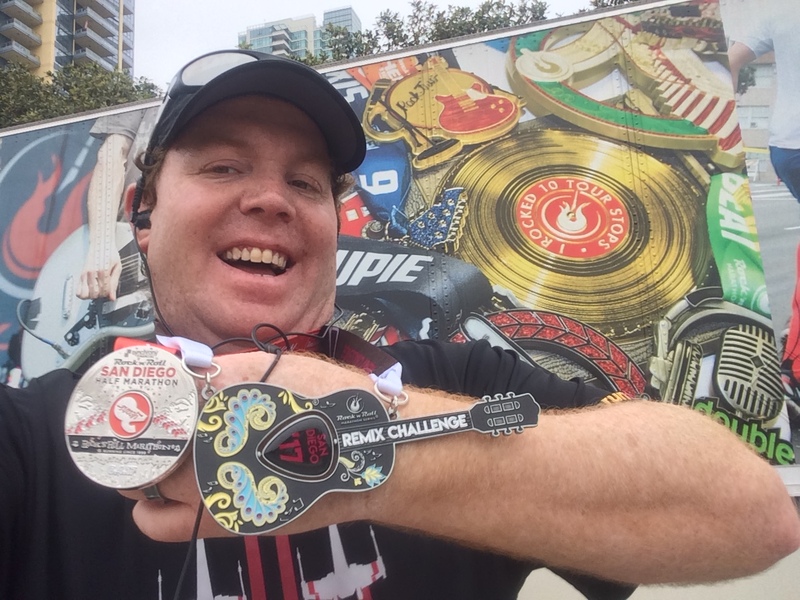 It’s my fastest half marathon since becoming a dad! For now, I’ll take it!